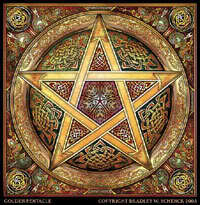 when i first got into Wicca it was with my younger half sister and my best child hood friend. we were having a sleep over when we decided to do a ritual we found in an old book. it was a sort of binding spell. the spell was call circle sisters. we cast our circle purifying it and calling the elements after that we each cut our wrists placing five drops of blood each on a red green blue purple and yellow braid one drop for each of the elements. after that we sealed the end of the braid with candle wax and went to sleep as each of us slept we each had a dream mine was dancing with fire at a carnival yet i had no props. Sara's was running on the Branch of a ancient forest with giant trees and my half sisters was swimming deep in the ocean but she was still able to breath. then in all of our dreams we heard laughter like a mothers laugh comforting each of us woke up cause it felt like some one was taking a knife to our hands when we woke up each of us hand a different symbol carved into our hands i had a sun Sara had a leaf and my sister had a tear drop. after a couple years they stopped practicing and their marks went away mine faded to but its still there and i still practice.